While I sit here in the midst of a hurricane, I can’t help but think of the currents that John Wilkes Booth and David Herold had to overcome in their attempts to cross the Potomac River. I certainly wouldn’t want to be out on the water today with this little row boat. 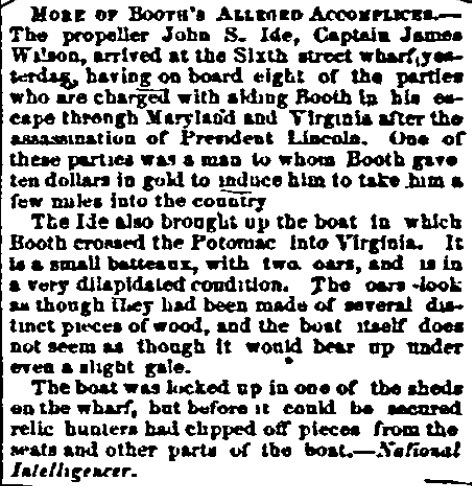 I actually just found that newspaper from 5/20/1865 with the illustration of booth’s body being dumped into the Potomac. I wonder if it is worth anything. Harper’s Weekly and Frank Leslie’s Illustrated newspapers are often up for sale on eBay and other places. I’m sure you’d be able to find some civil war buff who would want an original copy.